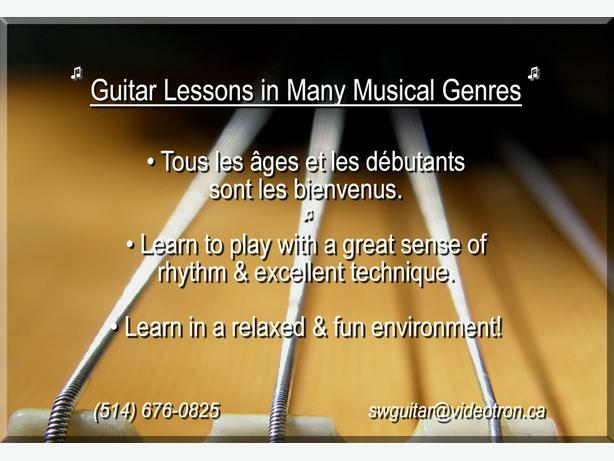  Log In needed Guitar Lessons, West Island - Beginners to Advanced Levels! - Learn to play the guitar with confidence and a great sense of rhythm (ROCK, BLUES, FOLK, ACOUSTIC and various other genres!). - Learn strumming/picking patterns and licks/riffs used by well-known players and singer-songwriters. - From recordings, learn ear playing skills to meticulously analyze and then recognize chord shapes, scales used, string bends, and various common techniques. - Memorize complete forms of songs, studying the guitar parts within, from recordings and sheet music. - Lessons on FINGERSTYLE, LEAD, RHYTHM and IMPROVISATION techniques in a variety of genres. - Learn to read guitar music from manuscript, tablature and chord charts with well-planned guidance and direction. - Learn the necessities concerning instrument care, string changing and maintenance. - Beginners to advanced students, all ages welcome! - Quality instruction, offered with a total dedication to the needs of the student. - Learn to apply warm-up and technique ideas to the needs of your playing style. - Learn to play with a great tone - plucking hand approach covered in great detail! - RCM exam preparation, all grades (optional). - Apprenez à jouer de la guitare de nombreuses périodes historiques. - Tous les âges et les débutants sont les bienvenus. - Form and analysis of studied works. Along with regular practice, progress depends on a healthy mixture of gradual and steep technical and musical challenges, be them in a beginner study/exercise, a folk song, a burning solo or a Baroque Period piece. Learn to break things down to minimum detail, for the purpose of improving ideas such as basic single-note finger placement, beginner/advanced chord changes, specific areas of a song, rhythm, coordination and various other concepts which we all need to constantly work at in order for them to have happen more naturally. I enjoy zeroing in on what really needs to be worked on the most - very particular to each individual, which with practice and focus, helps students experience constant progress in many areas of their playing!